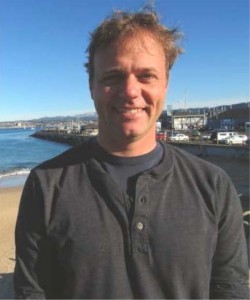 Tom is a physical oceanographer who studies the dynamics and ecological impacts of circulation in the coastal zone. Currents and water properties near the coast are influenced by a wide range of processes, including: wind-driven upwelling, tides, turbulent mixing, surface waves and internal waves. Unravelling these complex and interrelated physical processes is important for understanding how marine ecosystems respond to changes in weather and climate. The physical oceanography lab uses a variety of techniques to study coastal circulation patterns. Observational data from ships, moorings, buoys and drifters are analyzed to characterize the marine environment and test theories of ocean circulation. This observational work is complemented by model experiments on the computer, where factors like waves, wind and tides can be controlled. Research topics include the formation of low-oxygen zones, transport of toxic algae blooms, enhancement of upwelling near submarine canyons, interannual temperature variability, and the effects of shoaling surface waves on nearshore circulation.